I love Edward Gorey and this book is so Edward-Gorey-esque. And while I would not read most Edward Gorey to my son as it is a bit too macabre for a 5-year-old's inquisitive and hyperactive imagination, this we can do. And also, aren't most kindergarteners fascinated with the macabre naturally? They always want to look at other people's scrapes and cuts (especially if there is blood) and love spooky cartoons (hello, Scooby Doo, superstar of the elementary school set). So, when I found this book, I knew it was perfect for Beeper --and me. 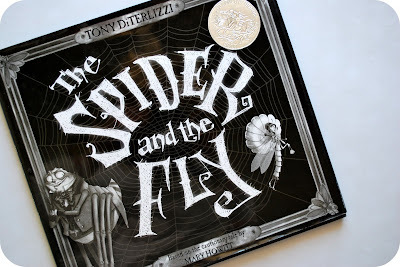 The book is The Spider and the Fly by Tony DiTerlizzi, and is closely based on Mary Hewitt's original version of the poem written back in 1829 to serve as a cautionary tale to her own children to guard against, well, bad people and their wiles, I guess. Tony's main inspiration in illustrating the book was classic Hollywood film noir. And the illustrations are the superstar of this book--chock full o' darkly realized detail and clever renderings of the spider's world. The spider is indeed dapper with a Clark Gable moustache, dressed in a quilted smoking jacket and fez, his feet propped languidly upon a dead ladybug serving as a footstool. And the poor, ill-fated fly? 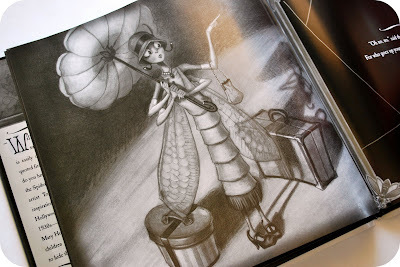 Well, she is a dragonfly fashionably outfitted in flapper-like attire wiht a posie parasol--alluding to what will be the source of her eventual demise (vanity). 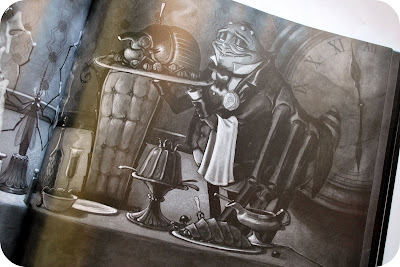 The book is simply laden with clever details like the beetle roasted with an apple in its mouth served up as dinner, the fretfull ghosts of insects-past lurking in the background of most photos, trying desperately to warn the poor dragonfly (one bug holds and tellingly points to a copy of The Joy of Cooking Bugs in one scene from the book), and the classic old Victorian house with a light in the topmost window only (Psycho, anyone?). As in the original poem, there is a dark ending to the book, if that is the sort of thing that puts you off--I mean, dark in that the dragonfly does end up well bound to the spider's web, not dark as in the spider gets a hacksaw and gorily butchers the dragonfly and then enjoys her with a lovely Chianti and some fava beans. I happen to believe the book is a great entre into a conversation wiht your kids about using judgement and trusting your gut about people--even if that conversation only last 30 seconds before they ask if they can watch the SuperFriends on DVD again now, and also that they have to poop. 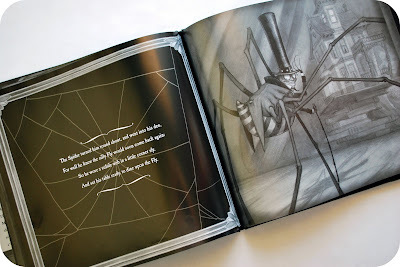 Oh, and I should mention that The Spider and the Fly was a Caldecott Honor Book. You might like to know that. Eeek that is beautiful! 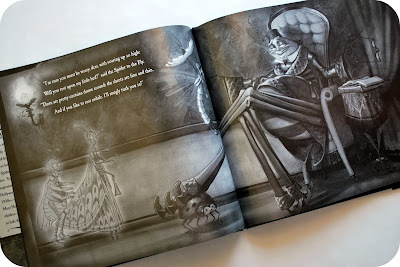 Those illustrations are awesome (I think the word "awesome" is engraved on the Caldecott medal actually).